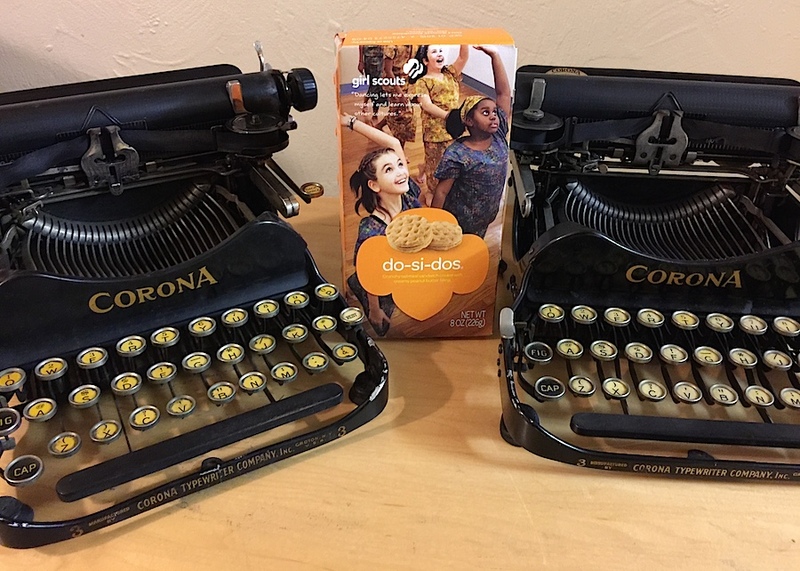 Two Coronas in my collection — note “Rest” key on left machine — and a box of Girl Scout cookies. Got the cookies from a kid in my neighborhood. Hanks, accompanied by his college-age son, Truman, was in town to visit the typewriter shop, Los Altos Business Machines, at 100 State St. Truman is a freshman at Stanford University. It turns out that Hanks is a big typewriter collector. He initially went to the store to have his son’s typewriter repaired, but he ended up buying two vintage Smith-Coronas. Visit Los Altos Business Machines. "No longer a breach of etiquette"
Beautiful story. Thanks for sharing and promoting typewriters and Girl Scouts.